Since becoming governor in 2005, Joe Manchin's administration has made great accomplishments - from cutting taxes to creating good jobs and getting our financial house in order. While other states have been hit hard by this global economic downturn, West Virginia has maintained a strong, responsible government, and Joe Manchin will work even harder to bring responsible government initiatives to Washington. He is known throughout West Virginia and our nation as a person who will listen to all sides. He is an independent voice who can work across party lines to achieve solutions to today's challenges. Joe Manchin's hometown is Farmington, W.Va., a small coal mining community. He attended West Virginia University on a football scholarship, married his wife, Gayle, and became a successful businessman. Joe Manchin got his start in public service as a state legislator from 1982 to 1996. He served as West Virginia's Secretary of State from 2000 to 2004. His administration was known for its outstanding customer service. As governor, Joe Manchin values all of our people's input. This team builder mentality has help Joe Manchin to become a leader on the national scene as well, now serving as Chair of the National Governors Association and Chairman of the Southern States Energy Board. He is also the past president of the Council of State Governments, a past chairman of the Democratic Governors Association and the Southern Governors' Association. Gov. 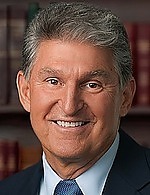 Manchin is an avid pilot, outdoorsman, hunter, angler and motorcyclist. He has been married for 42 years to the former Gayle Conelly of Beckley. They have three children and seven grandchildren. 05/12/2020 WV Governor - D Primary ?? ?